YOU ARE BIDDING ON AN ORIGINAL UK ALBUM RELEASE BY. ' THE OPEN MIND '. " THE OPEN MIND ". FIRST PRESSING. RELEASED ON THE ORIGINAL PHILIPS LABEL SBL 7893. STEREO. RELEASED 1969. SIDE ONE; DEAR LOUISE. TRY ANOTHER DAY. I FEEL THE SAME WAY TOO. MY MIND CRIES. CAN'T YOU SEE. THOR THE THUNDER GOD. SIDE TWO; HORSES AND CHARIOTS. BEFORE MY TIME. FREE AS THE BREEZE. GIRL I'M SO ALONE. SOUL AND MY WILL. FALLING AGAIN. THE ORIGINAL LAMINATED SLEEVE ISIN NEAR MINT CONDITION. NO WRITING. NO SPLITS. CLEAN SPINE. BRIGHT AND CLEAN. VERY, VERY SLIGHT LIFTING OF LAMINATE, DOWN THE SPINE EDGE. ORIGINAL INNER SLEEVE. THE VINYL IS IN NEAR MINT CONDITION. NO MARKS. NO SCRATCHES. NO CLICKS. NO POPS. NO NOISE. PLAYS SUPERB. BOTH LABELS VERY CLEAN AND BRIGHT. NO WRITING. NO MARKS. MATRIX NUMBER SIDEONE; 844241 1 Y // 3 4201 . SIDE TWO; 844241 2 Y // 2 420 1 1. 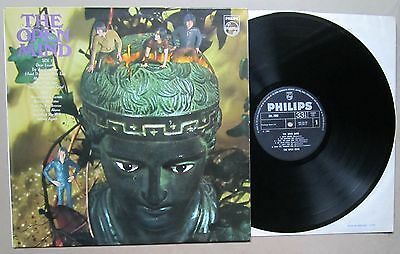 A REALLY EXCELLENT, MEGA RARE ORIGINAL FIRST PRESS PSYCHEDELIC, EARLY ALBUM. OVER 45 YEARS OLD. TRACKED / SIGNED FOR AIRMAIL; £16.50.EUROPE. £18.50. REST OF THE WORLD. IF YOU ARE NOT ENTIRELY SATISFIED WITH THE ITEM. PLEASE CONTACT ME, SO THAT I CAN RECTIFY THE ISSUE. I WOULD LIKE YOU TO BE 100% HAPPY WITH OUR TRANSACTION.